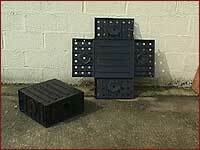 We supply a flat pack preformed Sump2000 which conforms to Building Control requirments. It is designed with 110 mm blanking plates on each side, no additional coupling fittings are required making it very cost effective. It is lightweight, easily stored & complies with BR 211 building regulations. If you have concerns about the possibility of radon in your commercial premesis or home, we provide a comprehensive, confidential and accurate radon testing service. Copyright © 2005 - 17, Radon Centres.